Supply Chain Disruptions have become priority since the recent history of major disasters. Eruptions from the Eyjafjallajokull volcano in Iceland brought air travel to a grinding halt. Business people were stranded, UPS and FedEx posted notices to customers about delays in shipments to Europe, and everything from flowers and vegetables to clothes and car parts are putting a serious hitch in the reliability of global supply chains. 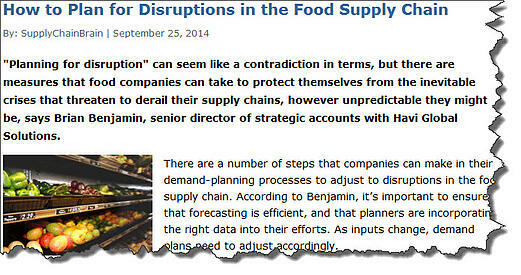 "Planning for disruption" can seem like a contradiction in terms, but there are measures that food companies can take to protect themselves from the inevitable crises that threaten to derail their supply chains, however unpredictable they might be, says Brian Benjamin, senior director of strategic accounts with Havi Global Solutions. The Forbes news article, cited above, highlights more supply chain management disruptions related to supply of oil and in the recent past, the disaster in Japan. "LOS ANGELES -- Shares of automakers and suppliers fell Monday, weighed down by growing concerns over rising gas prices and lingering manufacturing and supply disruptions following last month's earthquake and tsunami in Japan." "On Friday, Toyota Motor Corp. ( TM - news - people ) announced it would suspend production at its North American plants in a series of one-day shutdowns this month due to the parts shortages. The North American plants have been using parts in their inventory or relying on those that were shipped before the earthquake. Toyota also said it plans to resume car production at all its plants in Japan at half capacity from April 18 to 27"
A plan and policy for disaster operations. A data disaster backup and recovery plans. A paper backup system to operate with in case of disaster. Practice disaster recovery and system outage regularly. Know what to do in case of a disaster. Know who are the key people and do they know their roles in case of disaster. Have off-site backup rotation cycles. Know where your critical information is stored and who has access. Without a well documented and practiced plan of action your company may be at risk. How ready are you for these emergencies, events and disasters which can cause a disruption in the supply chain? If any of these events happened, does your company have business continuity plans as was the case in Iceland, Japan, New Orleans or .. your town? We live in an intertwined supply chain dependent world where any single event can mean the stoppage or loss of business. We have become buy-as-needed, JIT (just in time), inventory where demand and supply meet in the shipping lanes and usually converge at the customer. We now need to account for the possibility this may not always be the case. Is it still best practices with off-shore manufacturing to remain dependent on what may become an unreliable and unstable global supply chain? Should we think of bringing back, minimally, the core capability to produce in case disasters of all kind strike? What does this mean to business planning and forecasting? How do we tailor our operations to be able to deliver to our customers and how can we make it happen? Santa Clarita Consultants can provide an ERP Enterprise system which is completely hosted and costs a fraction of the antiquated ERP systems of yesterday. With the right ERP Enterprise system hosted in the cloud, recovery time for the business is drastically reduced and Supply chain disruptions can be managed with expedience. If you are interested in learning more about a low cost ERP System in the cloud, contact Santa Clarita Consultants for a demo.